Sunday Supper is again joining up with American Family Insurance as they inspire and encourage all of us to #ChooseDreams. We all dream that our families will be happy and healthy, and that means taking some of our family favorite recipes and making them healthier, whether this means making them lighter, packing in more veggies or superfoods, or accommodating food allergies. Who doesn’t love tater tots and Buffalo chicken? Not exactly health food, that is unless you transform them into Buffalo Cauli-Tots. Welcome to my family: 1) I have a wheat allergy, genetic high cholesterol and love salads with fruit and cheese, a medium rare steak and ice cream pretty much equally; 2) The Hubby will eat fruits and veggies if I serve them, but not on his own accord, doesn’t call it a meal if it doesn’t include meat, but also has a pretty big sweet tooth; 2) The Bug loves fruits and veggies, but is also a carb- and cheese-aholic, would happily pass by the chicken or beef, and his favorite foods are peanut butter, bananas, and chocolate; 3) King Stuff is also known as paleo- or carnivore-baby who would rather gnaw through a steak and tomatoes with his four teeth than macaroni and cheese. Not only do I want to make sure I feed my family healthy, nutritious food, I also have to accommodate all of these needs and preferences. One of the things I try to do is to get them to eat as many fruits and veggies as possible. Fruit is never an issue – they will happily devour berries and melons and apples and pineapple, even dried fruit, like prunes, dates, raisins and figs. I do want to make sure my kids enjoy eating vegetables in as close to their original form as possible – salads, tomatoes, steamed carrots, cucumbers, and roasted broccoli make daily appearances on our lunch and dinner plates – but it never hurts to squeeze in some extra. And the best way to squeeze in extra is to make it fun. So enter things like green smoothies, produce-packed spaghetti sauces… and Cauli-Tots. Now, I always tell my kids what’s in the food I make for them. I I figure, if they see spinach go into a smoothie or cauliflower go into a tot and they like them, then they will be much more likely to eat said vegetable when I put it on their plate looking like, you know, a vegetable. And while my guys will much their way through a pan of roasted cauliflower, tots are way more fun. Oh my oh my oh my!! People, I LOVE these Buffalo Cauli-Tots. A little less cheesy and a little more crisp than my other versions, since I needed more cornmeal because of the extra moisture from the hot sauce. But wow, just so much flavor, such perfect tot texture. We loved them dunked in my Greek Yogurt Blue Cheese Dip, but you could also use your favorite Blue Cheese or Ranch dip or dressing (I’m working on a super quick and easy Greek Yogurt Ranch Dip for you). And they aren’t super spicy, so the kids while still eat them, and you can always sprinkle some more sauce on top if you need a little extra kick. These will be coming back to my table over and over!! And think of how much fun they would be for snacking on while watching the game with the guys (or girls). That is where Sunday Supper comes in. Together with American Family, we are giving you recipes for Family Favorites Turned Healthy, whether this means making traditional comfort foods healthier, sneaking in some extra veggies, giving the kids healthy snacks, or accommodating different food allergies. So I hope you’ll try this and many of the other nutritious and delicious recipes on the Family Favorite Recipes #ChooseDreams Pinterest board. We will be pinning lots of amazing Sunday Supper and Weekday Supper recipes, from appetizers and salads to main dishes and desserts, all summer long! 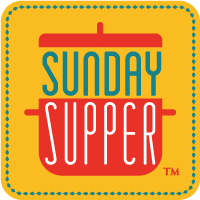 Make sure you check out the entire Sunday Supper menu of Family Favorites Turned Healthy at the bottom of this post. What are your favorite tips and tricks for getting your family to eat more nutritious foods? Want some more crazy tots? Did you boil the cauliflower first? You mentioned squeezing the extra moisture out? Nope, you use it raw, but as you squeeze it in the towel, the excess moisture will squeeze out. These look so amazing! Curious if you know of anything that could be used to bind everything together in place of the egg? Or, if they would hold up with just leaving the egg out altogether? Would love to make a vegan version of these! I haven’t tried without egg. I’d love to know how it works out for you. I realize you’re using mini muffin tins, but how many tots should this make? Hard to know how much to pack into each cup….. I make 24 from each batch. You’ll have to pack it down, plus that helps them stay together. These look awesome! Do you hava calorie count for these? No, I’m sorry, I have not calculated it. Pinned to a group board…yum!! You are the cauli-tot queen! I will be trying these soon. Thanks for sharing! Yeah more cauli-tots! I think you need to work for the cauliflower board or something, you truly represent this vegetable! Hi, I love the look of these, but what exactly, for a non-American is ‘hot sauce’? Um, this is an amazing idea. Love it, and can’t wait to try them myself! Thank you! I love to “buffalo” everything! These look delicious! And who doesn’t love tots!! I made something similar with cauliflower florets one time, but they were pretty messing when eating. These looks like they’d be a whole lot easier to eat! I can’t wait to try these!! 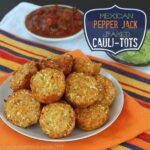 I am seriously obsessed with all your cauliflower tater tots recipes! This one is a winner for sure! I need to try your cauli tots. Such a great idea! This buffalo version is at the top of the to-make list…can’t wait! LOL I love the description of all your food habits. Your cauli-tots are always popular, and you choose such great flavors! OMG!!!!!!!!!!!!!!!!!!!!!!!! Your a genius! This recipe is just perfect! Perfect!! I want this! I love little bites like these! The fact their veggie, all the better! Snack happy! Oh yum! I love anything Buffalo-style! Me too, except wings, strangely enough! My kids also always know what’s in the food we eat and is has paid off that both of them love fruits as well as veggies alike. Oh, and your buffalo cauliflower tots looks absolutely fantastic! Thanks Bea! Yes, so important to make them appreciate fruits and veggies in all forms. This is a genius idea. There’s no way I’m sharing my tots. Pinned. Haha, my 1 year old and 4 year old didn’t want to share either! I think they ate six or more each! I loooooove tater tots, but try not to make them too often because I know they’re not great for us. But these?? These could become a weekly staple! They pretty much are in our house! Such a fun recipe — looking forward to making this with my kiddos! Thanks – definitely fun food for the kids! We are trying to eat more veggies, and I’m thinking my hubby would love these. I can’t wait to try them and see what he thinks! These are great for getting in an extra veggie serving! This is such a great idea!! My boys would love these! Well, we all would for that matter. We were all big fans here! Thanks! This sounds so much better the regular tots!!! I love the flavor!! 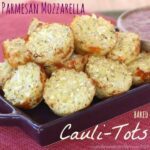 I remember you telling me about making cauli-tots when we were at BlogHer Food, and I have been wanting to make a batch ever since! Loving this new version with a kick – right up my alley! They are a little work but so worth it! These look delicious! My son would love this! You are truly the queen of cauliflower. I’m always inspired by your creations! These look awesome. Can’t wait to try them. Thanks so much. These might be my favorite! There you go combining my love of cauliflower and buffalo hot sauce. Awesome! Can you tell me how many cauli-tots this recipe makes? I’m having a party in two weeks with lots of little bites and want to serve these. They sound delicious. Also, are they still good at room temp? One batch will fill the standard 24 mini muffin tin. It’s easy enough to double if you need to. I haven’t tried the Buffalo ones at room temperature, but my basic cheddar ones are still yummy when cooled.